Now I can say, look: his work is a defense against injustice. Or in the more eloquent words of the London Book Bloc, inspired by its Italian counterpart, “books are our tools — we teach with them, we learn with them, we play with them, we create with them, we make love with them and, sometimes, we must fight with them.” In today’s fourth, most passionate and most ungoverned national demonstration against the British government’s wholesale privatization of higher education, books-as-shields replaced pens-as-swords. Creative militancy meets militant creativity, and this may be one of the most defining characteristics of the emerging student movement. It distinguishes it not only from the Chartist and 68er forebears to whom students increasingly refer, but also from many of the more traditionally rationalist responses of the most committed, but still institutionally invested, professional academics. 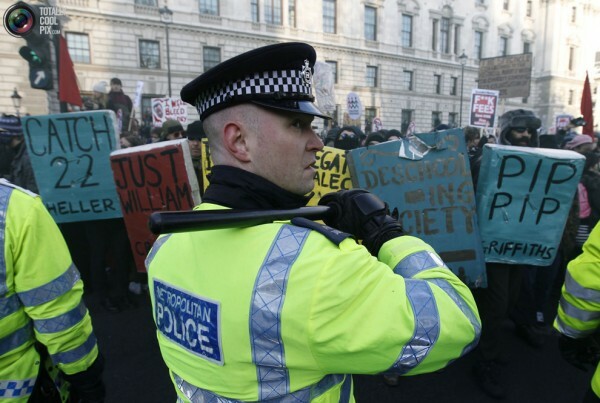 The photograph of students marching down the streets of London behind body-sized book shields entitled “One-Dimensional Man, Negative Dialectics, Catch-22 and Deschooling Society” is worth more than a thousand words; the image of a police officer pushing back an oversized edition of Aldous Huxley’s Brave New World is simply too ironic to be called so. The accomplishments of the performance are breathtaking. Wrenched from the abstractions of formalized education, with all but the barest of text abolished from view, social theory is materialized not only in practice, but as practice. By visualizing immaterial value, students restore to the figure of the book a gravitas that years of digitization and commodification have depleted. They do not shield themselves behind knowledge, but hold before them the symbolic promise of all the radical traditions of oppositional knowledge and politics signified through these works. The resulting spectacle of oppression is profound: students communicate symbolically the intellectual and cultural violence of the state’s abdication of education, and the authorities, ridiculously, actually interpellate themselves. The material-symbolic warfare of the book blocs is only one example of the new type of creative militancy, or militant creativity, now developing apace amongst British students, particularly in England where the attack on universities has been most severe. It has been marked even by the mainstream media, which published photo galleries of students’ handmade placards displayed at “Day X,” the first national anti-cuts and fees demonstration. The surprise was indicative: it seemed that no grown-ups thought students had much creative energy at all. So, when they showed up covered in Monopoly money carrying a sign saying “do I look like I’m made out of money?,” or dressed in bowler hats and bow ties carrying photos of David Cameron that read “this man has Eton my future,” or even simple sideways-held notebooks scribbled with “I can’t even afford a sign” and “where are your humanities?,” people took note. These kids know language. They say: we are not post-ideological. Even more importantly, though, their word games do not have quite the same fully carnival-esque spirit of some of the recent alter-globalization and Reclaim the Street protests, although the anti-privatization demonstrations often do involve singing, dancing, and hastily organized brass bands. There is rather a different kind of urgency about them: the performances are intended to entertain and educate, but also to defend and offend. The tradition of reclaiming space and time, of displacing the seriousness of the political, is growing well here, but in new conditions where cultural production must serve the needs of physical struggle as well as symbolic rupture. But the students are clearly reading their shield-books as well, and insight into other practices of creative militancy leaks out daily from occupied lecture halls and buildings through frenetic drips on twitter, blogs and online publications. Theories of how to reclaim and transform the university, or the idea of it. Theories of how to transcend it. Theories of how to begin to imagine something that is both radically alternative, and radically inclusive. And then there is practice. Practices, yes, of occupation and autonomous movement; of learning to radicalise the colonial gaze by exploiting its knowledge of oneself to anticipate, and thwart, one’s own confinement; of deploying critical research and argumentation to sway deeply held convictions, or deeply rooted attachments to power. But there is also practice, in the sense of an art and craft of resistance, of not being governed thus, by them, in this way, and etc. At the School of Oriental and African Studies, this week’s teach-in was followed by a day-long teach-out; as an attempt to “break out of the university bubble” the organizers offered a “massive symbolic lecture” at the Euston train station, distributing their own, utopian, Evening Substandard. People stopped to listen, both to the lectures and to the drums. All this with the intention, in the words of the already intrepid public-pedagogical University for Strategic Optimism, which stages five-minute occupation lectures in banks and shopping malls, to “educate your markets if you marketize our education.” It’s only been a few weeks, and already they are succeeding. Tonight, the UK news media was for the first time in my memory dominated by the serious voices of students, on the streets, in debates with government ministers, performing their new possibilities. In England they now talk openly about bringing down much more than university tuition fees. They can sing, dance, speak — and they understand critical theory, as well as know how to shelter behind it. Perhaps there is hope for a new education and a new politics after all.